Get Out the Funk and Soul With These Retro R&B Drum Grooves! Motown Multitrack Grooves Volume 1 is part of the Drum Masters series where you can pick out a la carte kits and grooves that work with Sonic Reality’s Infinite Player* plugin and build one of the most powerful virtual drum collections ever! This product is a collection of multitrack drum grooves made to be played from Sonic Reality’s Infinite Player. The grooves were recorded on a classic Gretsch soul kit in a medium sized room in a Nashville studio. These grooves and its matching multi-track Motown Soul kit are idea for R&B, Soul, Funk, Pop, Hip Hop, and other styles. Quote from Dave Kerzner of Sonic Reality about Motown/Soul Kit: "One of the special sessions done in Nashville for the Studio ProFiles series was a recreation of classic Motown and Soul multitracks. When it came to the grooves, almost every nuance from the drums to tambourine parts, foot stomps, claps and snaps were recreated. Since a lot of people often try to sample old Motown, Stax and Atlantic records from the 60's, grooves like the infamous James Brown beats heard in Pop and Hip Hop to Marvin Gaye, Supremes, Stevie Wonder and more... we figured that people might like the opportunity to have legit royalty-free samples of those styles that they CAN use in their music legally as opposed to resorting to just "lifting it" off records. It d be a dream for many to have access to the original multitracks of those sessions to sample and this title simulates that as well! To go along with those grooves or even just to have on its own this great sounding multi-sampled vintage Gretsch kit is a must-have for any classic funk and soul fan." 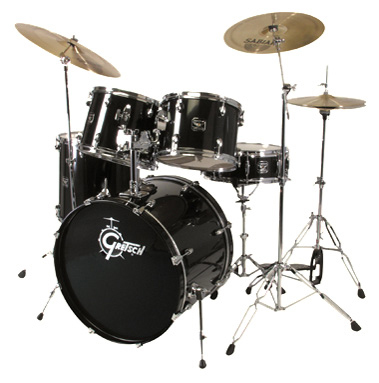 Gretsch Kick Drum: 20" x 16"
Gretsch Snare: 14" x 5.5"
Gretsch 2 Rack Toms: 10" x 8", 12" x 9"
Gretsch 1 Floor Tom: 14" x 14"
Zildjian 2 Crash Cymbals 18" 18"
Drum Masters Multitrack Drums put you in control of the mix as if you had the original multitrack master tapes in your hands! An accurate simulation of classic drum sounds allows you to create your own music with rare flavors of sound that were previously only a luxury to very few. This is ultimate production power inside your computer! Authentically played multi-track Drum Masters audio grooves can be combined with the midi-playable multi-track drum kit all from the same session to create the most realistic simulation of a live multi-track drum session of any drum plug-in today. • The only Multi-track Rex Loops Mapped to the Keyboard: These are currently the only time-aligned multi-track Rex loops playable from a midi keyboard! This offers the tempo flexibility of Rex format without sacrificing the discrete mix control of the mic channels. • Loops Can Automatically Sync to Your Host's Tempo! 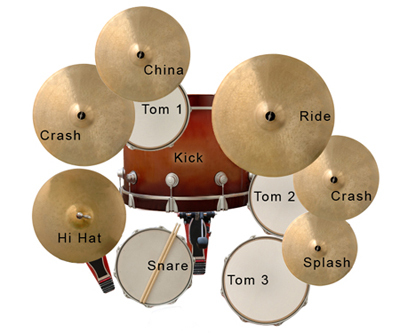 Drum Masters Multi-track Grooves are set to automatically sync to your host's tempo. This can be turned on or off in the plug-in for the ultimate convenience and flexibility in your work flow. All mention of Gretsch and Zildjian are for reference only. No official affiliation implied. 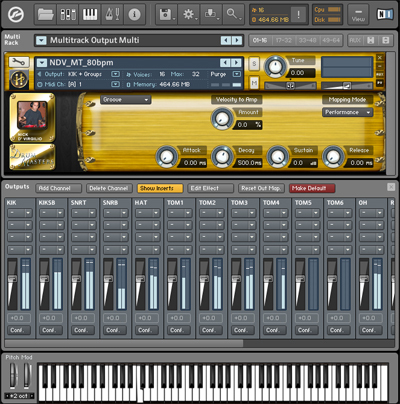 Kontakt is a registred trademark of Native Instruments. All other trademarks are the property of their respective owners.